Read through the following FAQ before contacting customer service with your inquiries. Most questions about our products, policies, shipping and payment are answered here. If you can’t find the information you are looking for here, we’ll be happy to answer your questions. 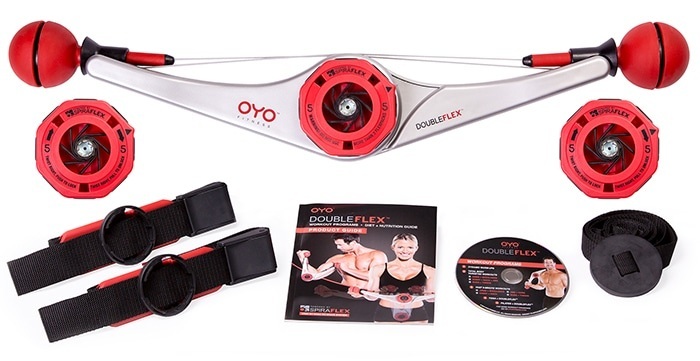 The OYO Personal Gym is a lightweight and portable total body gym that provides resistance on both sides of muscle groups during each DoubleFlex movement. The OYO Personal Gym uses patented SpiraFlex technology that provides the same benefits of lifting weights without the weight or momentum. SpiraFlex was originally developed for NASA as the Resistance Exercise Device on the International Space Station. SpiraFlex also powers the Bowflex® Revolution® home gym. How do you use the OYO Personal Gym? The OYO Personal Gym can be pulled and pushed while being held with the hands, or while attached to the ankles via the leg straps. The door strap attachment expands the number of total body exercises. For step-by-step guides to setting up and using your OYO Personal Gym, click on one of the products at the top of this page. 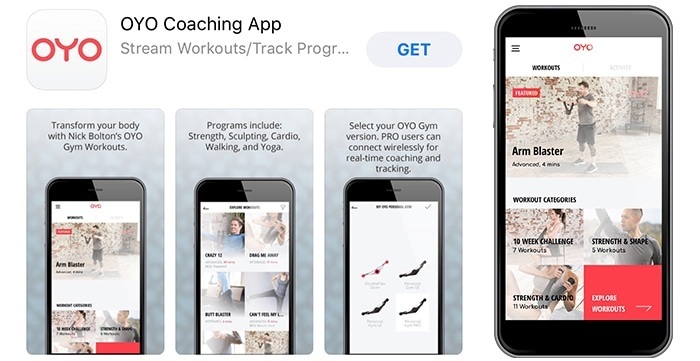 Visit our Workout Video Library or download our OYO Coaching App to see exactly how to workout with the OYO Personal Gym. What makes the OYO Personal Gym different than free weights or resistance bands? Resistance bands provide progressive resistance (like a rubber band) in only one direction. Free-weights are heavy, cumbersome and create momentum that can stress and injure joints. The OYO Personal Gym replaces free-weights and bands with a lightweight total body portable gym, that provides resistance to both sides of muscle groups with each movement, and feels like free-weights or a cable machine at the health club. You can get a workout in anytime, anywhere — at home, in the office or on the go. At the beginning of any fitness program your muscles may feel sore for the first few days. This is normal and as the weeks progress you will start to see the sculpting effects of building lean muscle while burning calories. Lean muscle also burns calories even when you are resting. If you wish to lose more weight, following Nick’s nutrition programs will help you reach your goal. Where can I find the OYO Personal Gym workout videos? You can access workout videos on our website here, on the OYO Fitness Vimeo channel, or you can download the OYO Coaching App. How do I clean my OYO Personal Gym? Clean with damp cloth only. Harsh chemicals and detergents may discolor or damage the device. 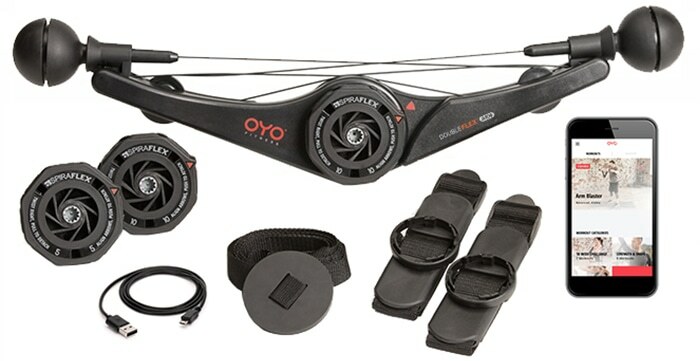 The OYO Personal Gym seems like a fun product. Can my children use it, too? The OYO Personal Gym is designed to be used by individuals over 14 years of age. The moving parts and other features of the device may be dangerous to young children. Do not allow children to handle or utilize the device. The OYO Personal Gym contains small parts that may be a choking hazard. All products on oyofitness.com ship only to the United States and Canada. 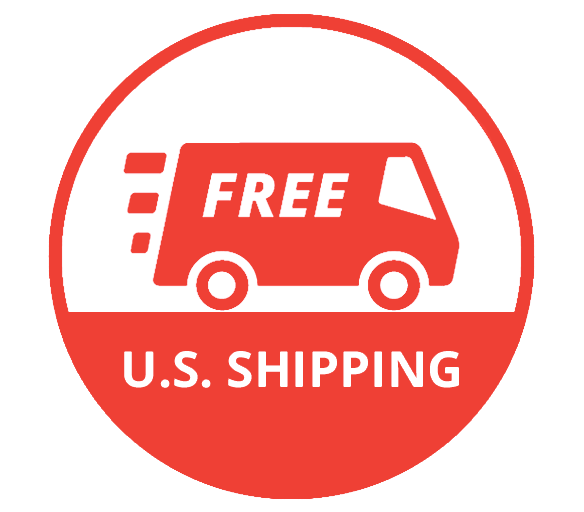 Free shipping for all U.S. orders and flat rate shipping to Canada at $10 for up to 2 items and $20 for up to 10 items per order. For Canadian orders of more than 10 items, please contact us for special shipping pricing prior to placing your order. 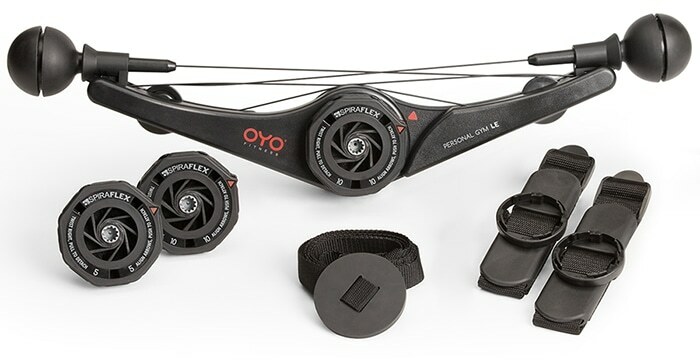 The OYO Personal Gym and OYO Personal Gym Pro are available on IndieGoGo with a flat rate international shipping cost. If you are outside the United States or Canada, this would be the best way to order your OYO Personal Gym. Orders placed on OYOFitness.com usually ship within 2 business days of payment confirmation. Delivery time can take 1 – 2 weeks from date of shipment depending on address. Orders placed on Indiegogo must be confirmed with a Backer Survey due to how Indiegogo works. 14 days after placing your order on Indiegogo, you will receive a Backer Survey; you must complete this survey prior to shipment. We release orders to our fulfillment house from Indiegogo weekly on Friday so that shipping can start the following Monday. What is OYO Fitness' return policy? All OYO Fitness products include a money back guarantee. If a customer is not 100% satisfied with their product, the product can be returned for a refund of the full price you paid including shipping and handling for a period of 30 days. The guarantee period starts from the date of delivery. Returns must be marked with a valid return authorization number (see FAQ “How do I return a shipment?”) and postmarked within the specified guarantee period to be eligible for refund. Return postage fees are the sole responsibility of the sender. OYO Fitness strongly recommends retaining proof of return on the small chance a package does not reach the warehouse as expected. If a package is lost in transit, a refund will only be authorized if the return shipment can be verified by means of a carrier receipt and/or tracking number showing a valid OYO Fitness return address as the destination. OYO Fitness is not responsible for packages that are refused at delivery, returned to sender, or sent without a return authorization number. Using any of these methods to return a shipment may delay or prevent the processing of a refund. See step-by-step directions below to return a shipment for a refund. Review the Return Policy (see FAQ “What is OYO Fitness’ Return Policy?”) to determine if the return is eligible for refund. Contact OYO Fitness Customer Service via our Customer Contact Form or by dialing 888-696-6503 during normal business hours to get a return authorization (RA) number. 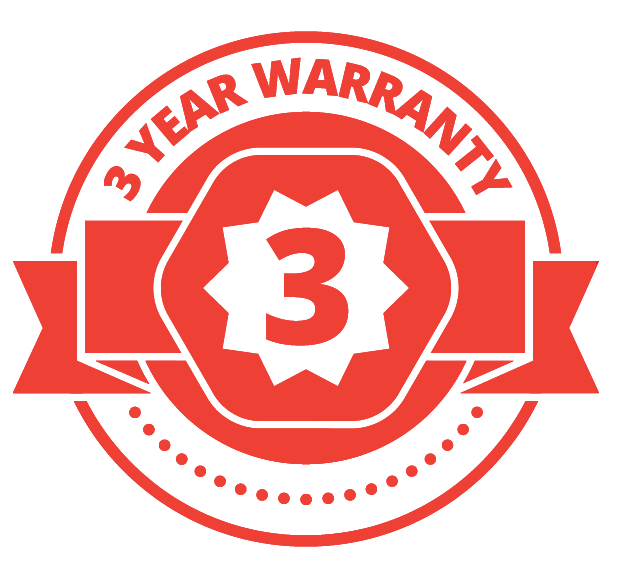 Prepare the shipment: Download and fill out any required forms from our Warranties page and include form in package. Write the return authorization number on the outside of the package in several locations. Mail the package and keep proof of the shipment (e.g. carrier receipt or tracking number) and send it to the address on the packing list you received with your shipment or the address provided by the customer service representative when obtaining your RA number. When will the refund be processed? Once a return is received at the warehouse, refunds are usually processed by OYO Fitness within 1-2 weeks. The financial institution receiving the refund may take additional time to process and return the funds.